--pub. By Southern Historical Press, Inc., 275 West Broad St., Greenville, SC 29601, 1991 pgs 116, 117. Anthony Dunkin/Duncan, Green Co., TN to William JACKSON, Sullivan Co., 152 acres on the head of Sinking Creek waters of the Holstein. 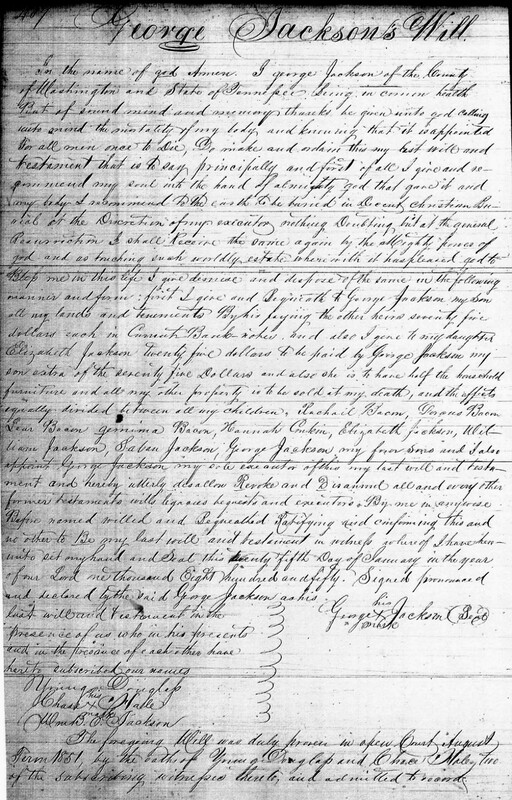 230 acres of land, occupied by Jacob Job, deceased, released by right of descend to Samuel, Dorcas, Lydia, Zachariah, James and George Job to John Cox, William Jackson, George Jackson, and Thomas Barron. 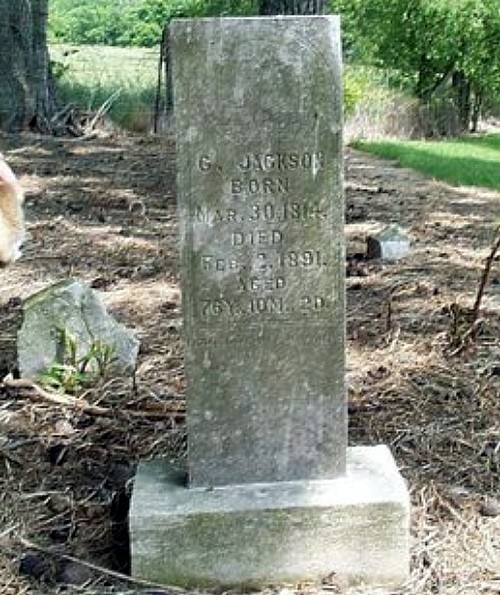 George Jackson was age 81 with his daughter Betsey age 38.
first i give and Bequeath to George Jackson my son all my lands and tenements By his paying the other heirs seventy five dollars each in Current Bank notes and also I give to my daughter Elizabeth Jackson twenty five dollars to be paid by George Jackson my son extra of the seventy five Dollars and also she is to have half the household furniture and all my other property is to be sold at my death, and the effects equally divided between all my children, Rachael Bacon, Dorcus Bacon, Lear Bacon, gemima Bacon, Hannah Conkin, Elizabeth Jackson, William Jackson, Saban Jackson, George Jackson my four Sons and I also appoint George Jackson my sole executor of this my last will and testament and hereby utterly disallow Revoke and Disannul all and every other former testaments wills legacies bequests and executors By me in anywise Before names willed and Bequeathed Ratifying and confirming this and no other to Be my last will and testament in witness whereof I have here unto set my hand and Seal this twenty fifth Day of January in the year of our Lord one thousand Eight hundred and fifty. The foregoing Will was duly proven in open court, August Term 1851, by the oath of Young Douglass and Chase Hale two of the subscribing witnesses thereto and admitted to record. 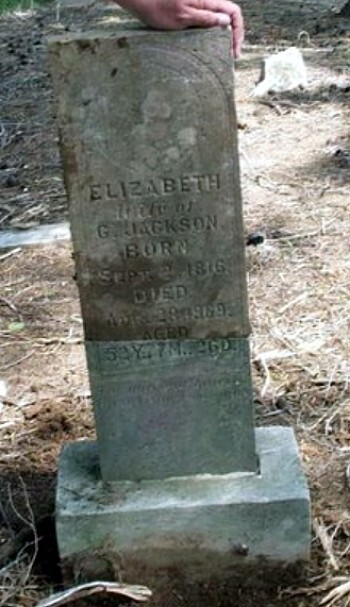 Many people state that John Bacon who married Leah Jackson was a son of James Bacon. In fact, Washington Co. tax lists show that cannot be the case as from 1831 onwards "heirs of John Bacon" and "Lear Bacon" are listed while it is not until 1838 that "John Bacon of James" is named concurrently with Leah Bacon. 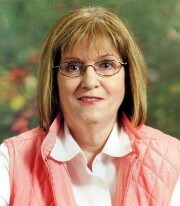 In fact, Leah Jackson's husband John Bacon was one of the eight children of Jeremiah Bacon and Delilah Pritchett. Old Photos or Cemetery Pictures?